For most of the public history of alcoholism and drug addiction all the way back to Noah, the general impression has been that it is something that happens to men. Women might have gotten “in trouble” with prescription drugs or white wine, but it was men who were drunks. Men were sent to prison; women were sent to mental hospitals. Of course women were drinking and drugging and some of them were getting in serious trouble, just like men. But mostly it was happening behind closed doors. It just wasn’t proper. The women’s movement started to change things. Through the 50s, 60s and 70s, as more and more women took charge of their lives and felt freer to express themselves, formerly taboo subjects were being talked about on the bestseller list and TV screens. But there was still a sense that the women doing these things were on the, shall we say, looser side of the spectrum. Betty Ford used her bully pulpit as first lady to change the conversation. She was a really big deal. God only knows how many lives of addicts and cancer sufferers her actions have saved. Then came Betty Ford, the first lady of these United States. First, she shocked the world in 1974 by saying out loud that she had breast cancer, something that proper women like her just didn’t do. Proper women would rather die, and did, rather than talk about their breasts even to their spouses and doctors. This one act has led to thousands of women getting checked in time and saving their own lives. Being a young boy, this event only crossed my radar later on. But in 1982 I definitely took notice when Betty Ford broke tradition again and far more shockingly by publically admitting her alcoholism and prescription opiate addiction, something a proper woman like her certainly didn’t do. Her family had staged an intervention and she had gotten help, but rather than hiding the fact, Ford decided she wanted to create a rehab specifically for women. While the Betty Ford Clinic has become a punchline of sorts thanks to all the female celebrities who have publicly announced their trips there in this day of too-much-exposure, even that is groundbreaking in its frankness. It is no longer a career-killer for a female celebrity to admit addiction. Help does not reach most alcoholics and addicts though, even today with all the openness. The addict must accept the help and do their part, and even then, some seem to struggle so much more than others. We had a few examples of female celebrities playing out their addictions in the public eye these last few years, but none more tragic than Amy Winehouse. Amy flaunted her impropriety. With her tattoos and crazy hair and makeup, she wasn’t trying to fit in. And hers was not a sudden unexpected fall. Winehouse was already struggling with addiction, depression, bulimia and self-harm when we first met her. Forgetting lyrics to songs, canceling gigs due to “exhaustion,” getting caught by paparazzi looking hung over and strung out with cuts and bruises: Some thought she was sad; many secretly enjoyed her blatant decadence. I felt some of both, but mostly I admired her stunning talent as both a singer and songwriter. Some thought she was sad; many secretly enjoyed her blatant decadence. I felt some of both, but mostly I admired her stunning talent as both a singer and songwriter. As if she wasn’t already flaunting her addiction issues enough, the apex of Amy’s commercial success came with the 2006 song “Rehab,” her only American top 10 hit, with the notorious chorus, “They tried to make me go to rehab, and I said, ‘No, no, no. '” Betty Ford may have built the rehab, but Amy wouldn’t go. Winehouse was willing to take anything to get out of feeling the present moment, including inflicting self-harm. When she overdosed in 2007, she had a mixture of heroin, ecstasy, cocaine, K and alcohol in her system. She did go to rehabs several times and reportedly stopped doing drugs two years before her death, but never managed to kick alcohol. It was simple alcohol poisoning that killed her at the age of 27 — with two empty vodka bottles by her side. 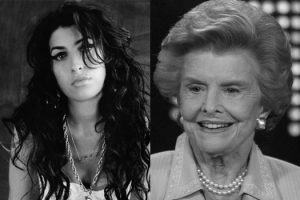 It’s a tragedy to lose anyone so young, but I can’t help wondering what Amy might have created had she managed to get and stay sober and live to 93 like Betty Ford did. I also write about how relying on my Catholic faith has been my life saver & sustains me throught this difficult journey. God bless your work! What a loss of talent when Amy died! Very sad, indeed, and it was like watching an out of control train heading for the cliff–unable to be stopped, to be brought back onto the tracks. I had also heard, don’t know if this is correct of not, that Amy may have had Bipolar disorder and had refused to consider medication for it.